Feudal War is in the opinion of many players on Conquer Club both the most versatile and one of the most strategic maps available. This is a conquest style map, meaning each player begins only with his starting region and must expand from there. There are a total of 82 regions on the map. It is helpful to think of these regions as either part of a kingdom or not. There are six total kingdoms, each has eight regions within its borders, including the castle. For every two regions of a kingdom a player controls, he receives a +1 troop bonus. Each round the owner of a castle gains a +5 autodeploy on each castle he controls. In addition, he receives the normal troop bonus based on region count (e.g. +3 if less than 12 are controlled, +4 for 12-14, +5 for 15-17, etc.). There are also three villages on the map. The villages have an autodeploy similar to the castle, only it is +3 per round. The map works superbly for any settings except 7 or 8 player and quad games, due to only having six starting positions. All types of spoils, and any game style will work well on this map and require different approaches. It is a very fair two player map as well. Size: Large, but as a conquest map this is not an issue. Complexity: Fairly complex, and rewards experience on the map to a great extent. Autodeploy (Player controlled Castles autodeploy +5, Player controlled Villages autodeploy +3). Bombardments (Castles may bombard any non-adjacent region in their kingdom; villages may not bombard). Conquest Gameplay (Players begin with their home castles and must expand from there, as the rest of the board is neutral). Naming Challenges (Regions are named and numbered, using a drop down menu it is possible to choose the incorrect region for an assault with disastrous consequences, most common is Barbarian 6 / Lake Minstello 6). Starting Position (There are 6 castles, in two and three player games each player starts by controlling two castles each, in all other games each player starts with one castle). Victory Condition (Control of all 6 castles at the beginning of your round results in an automatic victory). Generally speaking, this guide is written with Fog of War in mind because two thirds of games on Feudal War use that setting. There are some notes below on playing without Fog of War. Each player will begin with two random castles, while the remaining two castles will begin neutral (with 3 troops on them). Your goal will be to build a primary stack which will be your assaulting force to hopefully devastate your opponent. In no case do you want to divide the troop drop, stick with just one castle. If you have Realm of Might or Rebel Territory, generally speaking you will want to drop your troops there. The most important factor in play will be what type of spoils are used, and the type of reinforcement. For no spoils games, your first goal will be to seize the five regions with 2 neutral troops on them in each of the kingdoms. This will ensure you receive a +3 troop bonus for holding six kingdom lands. If you are playing with spoils, either escalating or flat rate, you must leave one region not immediately adjacent to a castle neutral, so that you can bombard each round to take a spoil. It follows that if you leave one region neutral, you shouldn't bother taking more than three of the neutral regions in one of the kingdoms. Your next step will be to either spread out and take a village bonus, or to stay within your kingdom and continue to build. If you can determine (based on spoils cashing and reinforcing patterns) where your opponent is, it may make your decision easier. Determining where your opponent is can be done by reading the log and seeing whether he has cashed a spoil with a +2 bonus on it (indicating he controls that region) or by looking at the assault pattern (for instance, when breaking out from a castle zone to a village, the number of neutral regions through which the assault went). Remember that if you go through your stack of 10 neutral troops on the border your opponent won't have to! The size of your main stack is critically important to determining when you strike. Because the assaulter has an edge when the size of the stacks is large (e.g. over 100), it generally behooves you to be the assaulter. But if you assault too soon, you have opened a pathway back to your castle that is unguarded by neutral troops. The sweet spot for assaulting varies, but generally 60 is too few while over 100 will almost certainly succeed if you guess correctly (and you assault first). Begin by playing some games with no fog of war (sunny) to get a feel for strategy, then adding fog of war as it is the secret ingredient that makes Feudal War excellent! Feudal War works incredibly well for multiplayer games, but does sometimes run the risk of stalemate, especially when down to 3 players. In order to reduce the odds of stalemate, Fog of War and Terminator game styles are recommended for 3 player games. Reading the game log is absolutely critical to success in games with fog of war! 3 playerThe basic strategy for a 3 player game is similar to two player, with the proviso that other than Rhu village (because it is only adjacent to two kingdoms), I would not recommend striking out for a village because it will weaken your kingdom's defenses too much. When playing with escalating spoils, it is critical to keep a neutral region in a spot where your stack will not take away your ability to take a spoil. For example, if you are on Great Kingdom castle, you have two basic options on where to stack. Either on the castle, after conquering GK1, 2, and 3; or on Great Kingdom 4 after conquering GK1, 3, and 4. Either way will work, but my preference is to reinforce the troops each round so I would pick the second. This goes back to not giving a "tell" on where you are. Feudal Empire, for example, MUST reinforce troops to at least FE3. Realm of Might will usually have to reinforce troops as well. If Realm of Might is one of your castles, make sure you do not take all five neutral 1 regions in your other kingdom, as ROM does not have an easy bombard region. Lastly, for 3 player, if you cannot eliminate an opponent, be wary of taking just one of his castles as it will leave him vulnerable to the third player taking him out (and gaining his spoils if it is an escalating spoils game). 4, 5, 6 playerThese games play very differently from 2 and 3 player, because you have only one castle to begin with. Generally speaking, the first player to make a move is not the likeliest to win because he will weaken himself so much in taking out the first opponent. Obviously this generalization doesn't always hold true (or else no one would assault first) but I prefer to strike after the first player has made his move. If played with escalating spoils, the best time to assault another player is when he holds 4 or 5 spoils, to try to get a double cash of spoils mid-turn. If played with flat rate or no spoils, the strategy is to eliminate another player while preserving enough of your strength to discourage an immediate assault by the remaining opponents. Again, generally speaking, assaulting before round 7 or 8 will not have good results. Terminator games are somewhat similar to standard, with a couple of twists. Early on, you can make a conscious decision that because of troop count, positioning, or poor luck with assaults that you will focus on getting a kill or two instead of trying for a sweep. Terminator is therefore slightly more flexible in terms of potential strategies, when compared to standard. The key to assassin games is to take out your opponent in one assault. If it fails, you will not usually get a second chance because you will be weakened enough for someone else to assassinate you. If you play with no fog of war, you can calculate with a great deal of precision your odds of successfully taking out an opponent, meaning the decision is strictly mathematical. If playing with fog, the decision becomes more intuitive, although spoils can sometimes give you an indication of who is where. Again, assaulting before round 6 is generally too soon but exceptions include when your target takes out one of his neutral 10's or when another player has launched his assault and is close to assassinating his target. Doubles is a format which shines in Feudal War. When played with fog, it combines the guesswork of two player with the bonus of not knowing on whom the other team is stacking. The key to winning doubles games is to try and eliminate your opponent's stack before they eliminate yours. Generally speaking, if your team holds Rebel Territory or Realm of Might castle, you will want to concentrate your troop drop there. Therefore, the weaker player generally does nothing but deploy to the stack, and take a spoil if playing with spoils. If you and your partner have adjacent kingdom pairs (Great Kingdom and Realm of Might, or Feudal Empire and Rebel Territory), an excellent strategy is to combine forces on a bordering region (RT4 and ROM7 are the best) in order to have the largest stack possible. Reading the game log is crucial to determine where your opponents are! Usually an assault can be launched by Round 6, but again, the longer it can be delayed the better the odds it will succeed. Triples is an interesting setting that allows for strategic deployment but removes much of the mystery of the map. Because every castle is occupied, and three of them are known to your team, the only question is which opponent is on each of the three remaining castles. As a result, striking first usually will yield a victory if you can destroy your opponents' stack. One player will be the stack while the two others will try to support the first. Again, if two players are adjacent linking up is a good strategy to use. No spoils removes much of the luck associated with spoils, instead emphasizing strategy and "intensity cube" rolling. The advantage of no spoils is that there are no "tells" on where your troops are, and no need to keep an open region in a kingdom (unless desired in order to have a path out) which in turn means proper play will be rewarded with more troops. Flat rate spoils plays uniquely for the first ten rounds or so, but then becomes very similar to no spoils. The reason for this is the autodeploy is so high in comparison to spoils that spoils take a secondary role. If you should get a 3 set of mixed spoils early, it may be the one time to violate the rule of trying to wait to rounds 6-8 to assault. Escalating spoils make for a very interesting game, because sudden shifts can occur in gameplay due to failed assaults. For example, if a player is trying to eliminate another and falls short, you might be able to pick up the spoils of both players fairly easily and finish the game. As a general rule of thumb, assaulting before the spoils cash is 20 or 25 is a bad idea. Nuclear spoils can have no effect in some games, and completely finish a game in others. If you should be lucky enough to draw a spoil with one of your opponent's castles on it, most likely it will result in a victory (and the converse is true too). I think nuclear spoils works well with 2 player on this map. The use of nuclear spoils in multiplayer is an interesting one because it allows you to study the game log for clues as to people's location due to a nuke taking one or more of their regions out. A few general notes on reinforcements. If you play with adjacent reinforcements, be very careful about conquering regions. Because so many of your troops are autodeployed on the castle, it is vital that you have either a direct reinforcement path or a stack adjacent to or on the castle. If not, you could have a troop superiority that goes to waste because of poor positioning. Conversely, with unlimited reinforcements be wary of making a move without considering that your opponents may be able to reinforce in strength, and quickly. My preference for Feudal War is chained reinforcements, as it allows for strategic movement without completely hamstringing you if a stack is locked in by friendly troops. 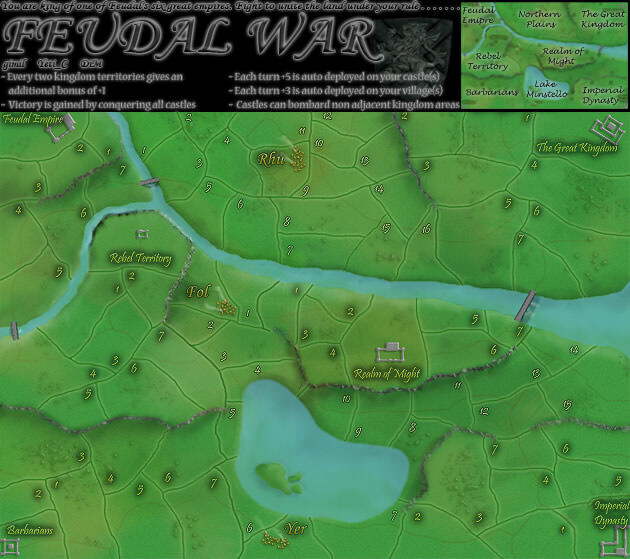 Compared to most maps on Conquer Club, Feudal War emphasizes speed less and strategy more in freestyle games. Key strategies include always trying to go first in 2 player games (to maximize your drop and allow you to reduce your opponent's), and making sure you are not last in a multi-player game (the last person to take a turn cannot take another turn until 12 hours have elapsed in a casual freestyle game unless someone else takes their turn first). If your opponent has a troop count advantage or will cash before you, try to spread as many stacks of 2 through your regions as possible. If playing with chained or adjacent reinforcements, do not open an assault path for your opponent from his castle. Instead sit just outside the bombardment range and assault the following round. If you find a neutral castle in 2 player you are most likely going to lose because you've given away your position. However, if you can hold the castle for 2 rounds you will most likely have made up the troop loss. (+5 autodeploy for 2 rounds = 10 troops plus castle region bonus is probably close to 14 or 16 troops in 2 rounds).